On Saturday July 2, I attended a March for Europe, and took the photos in my latest album on Flickr. The march took place in central London, attracting around 50,000 people, calling for Britain to remain in the EU, supporting the pan-European community that it has allowed to come into existence, opposing racism and xenophobia, and calling for MPs to refuse to pass the legislation that is needed for our departure to actually take place, rather than, as at present, being the preferred course of action of a slim majority of the 72.2% of the electorate who actually bothered to vote. The march took place just eight days after a shocked Britain woke up to discover that, after the most ill-advised referendum in UK history, those voting to leave the EU had secured more votes than those who wanted to stay in. Those attending were just a fraction of the 16,141,241 people who voted to remain in the EU, but the march was an important sign of hugely important dissent that, I fervently hope, will not go away. We need to maintain pressure on our MPs not to accept the result — not out of any anti-democratic sentiment, but because: 1) leaving the EU would be disastrous for our economy and our standing in the world; 2) isolationism has already led to a rise in racism and xenophobia, apparently normalised by the result; 3) the referendum should never have been called, and was only called because of the narrow party political concerns of David Cameron, and not because of any need for it; 4) the Leave campaign’s efforts to secure victory, with the collusion of large parts of the media, involved telling voters disgraceful lies, and Boris Johnson, who did so much to ensure its success, didn’t even believe in it, and only supported it in the hope of furthering his own political aims; 5) most importantly, Parliament has to endorse it before it can happen, and MPs’ obligation is to vote in the best interests of the country, not to rubber-stamp the result of a unjustifiable referendum; and 6) as some lawyers are arguing, the process of triggering our departure from the EU, if enacted, would be unlawful. Because the result was advisory, it is not legally binding. It needs Parliament to endorse it, and Parliament should clearly do no such thing. 75% of MPs support us remaining in the EU, and, as Geoffrey Robertson QC stated in ‘How to stop Brexit: get your MP to vote it down,’ an important article for the Guardian last week, “‘Sovereignty’ — a much misunderstood word in the campaign — resides in Britain with the ‘Queen in parliament’, that is with MPs alone who can make or break laws and peers who can block them. Before Brexit can be triggered, parliament must repeal the 1972 European Communities Act by which it voted to take us into the European Union — and MPs have every right, and indeed a duty if they think it best for Britain, to vote to stay.” Please also see the withering criticism of his colleagues for creating this disaster by veteran Tory Michael Heseltine here and here. If you’re interested in ongoing moves to prevent us from leaving the EU, please sign the petition to the government, ‘Let Parliament decide whether or not we remain a member of the European Union,’ which currently has just over 10,000 signatures. And if you’re in London, or nearby, please come to ‘Stand Together: London Park Picnic Against Brexit,’ on Saturday (July 9), in Green Park, near Hyde Park Corner, where the intention is to hold not only a picnic but also a General Assembly, to discuss post-Brexit tactics. Please also check out this letter asking the House of Commons to appoint an independent judicial committee, comprised of senior Commonwealth judges, to review the scale and impact of lies and distortions in the run-up to the referendum, for which signatories are still being sought. We are the masses, we are the 48%, We were NEVER given the real facts, never the real truths, just lies, and half truths. We were bombarded with propaganda by politicians who seem to disappear from the lime light on a daily basis. We are British, and we are European, and we are proud to be both. I beg you in GODS Name, come out and march for Europe. In a time when sleeping China has awoken, North Korea gets nuclear, the Middle East is fragmenting, India, Pakistan, are raising there heads. Pollution, Global warming, and Mother Earth is begging NO MORE. We need to be strong, we need to be british, and we need to be European, we need to stay united, PLEASE open up your minds to the bigger picture. Wow! Thanks, Enda, for the passionate defence of us as both British and European! I just wish it was much more strongly worded, David. I think it’s Parliament’s obligation not to endorse the outcome of the referendum. I don’t see there being any wiggle room. Don’t give up Andy. We have to keep going on this. It’s too important and we really can’t be led into a situation where the leaders not only don’t have a plan but quit before they get further embroiled. Yes, it’s becoming absurd, Rosalinda. Cameron disappears on Day One, then Boris drops out, now Farage has resigned, and Gove, of course, has zero credibility. Where is the leadership? We are a country without a leader! And now we’re all supposed to hang around for months until the Tories sort out some dreadful successor to Cameron (who really must be held accountable for getting us into this terrible situation), and who they want to be crowned without the inconvenience of a General Election. It’s beyond satire. And now Newsnight is focusing on the other non-entities of UKIP, instead of starving them of the oxygen of publicly, Damo. Hello, wake up, BBC. Now Farage has walked, it really is time to ignore them. Great photos Andy. You take great photos and choose your subjects so well. Thanks, Ann! Great to hear from you! Thanks, David. Glad to see this story getting coverage. The more the better. So we remain a lame duck laughing stock, consumed with internal idiocy – the Tories’ leadership election, the Labour coup – while the economy is just at the start of a prolonged period of uncertainty, which can only end up being extremely damaging, as the markets hate uncertainty. And while some on the left will be telling me that this collapse can only end up being beneficial in the long run, I’m not seeing it – the poor will be hit the hardest, and the racism and xenophobia unleashed by the referendum will only get worse. Most of all this morning, I’m appalled by the silence from the Labour Party. On Saturday, 50,000 people, largely independently, marched in London. It was a carnival of homemade placards, with, as far as I could see, no institutional backing, and, I imagine, lots of first-time protesters out on the streets, but where were the voices of the left? Did everyone on the left back Leave? As I said to a friend who campaigned to Leave for anti-neoliberal reasons, it was only going to be useful if we immediately had a socialist revolution. That clearly hasn’t happened, and nor does it look like happening anytime soon. This is becomeing serious the economy is starting to freefall …..the brexits ….happy now…..i am amazed that a mob hasnt gone after farage and johnson …. Endless distractions, Damo, plus playing on people’s profound desire not, in general, to be depressed, seem to be doing the trick. Now it’s all the Tory leadership nonsense, and no one’s left to remind the public endlessly that this is a Tory-made disaster, caused by Cameron and Johnson, and that no one should be indulging their wretched business-as-usual behaviour. How do Dave and Boris get to walk away unscathed? Thease tories realy do show utter contempt for people dont they ,they think people are stupid, are economic problems …and they are getting worse by the day…are all over the news….the real news …forget bbc or sky..cameron,johnson,gove,farage …have just slithered away ….well we see about that…..
What a shambles. How are we supposed to put up with these clowns? Distraction, distraction, distraction + government right wing media + people don’t care = a colosul mess ….this countrys standing in the world is plummeting on a daily basis nor to mention out economy ….if artical 50 is triggered we realy will be in trouble ….i watched ch4 news on chilcot …..what a disaster …..
I’ve been suffering from a profound feeling of powerlessness the last few days, Damo, and Chilcot just added to it – politicians responsible for horrors, but not actually held accountable, just like the Tories, who may well have backed the Iraq invasion if they’d been in power, but who have definitely been waging war on us since 2010, and yet are not being held accountable. Jeremy Corbyn gave a great speech yesterday, post-Chilcot, the coup leaders have admitted that they failed, and yet Labour is still silent on our new place in the world – going slowly down the plughole. I fear that the left (including Corbyn) are generally supportive of our new-found isolation, and won’t criticise the Tories for having got us out of the EU, however irresponsibly that departure occurred, while the Blairites are so fearful of upsetting Leave voters that they’ll be silent too. Where’s the opposition? We have no government, we have Oliver the idiot Letwin in charge of our Brexit plans (there aren’t any), and yet mostly all I hear is silence – or irrelevant distractions. Here’s all I could find in the Guardian. In the mainstream media as a whole, I expect there’ll be just a cursory discussion of the ongoing collapse of the pound, under a leaderless government. How can that not be the one and only story? Because when things are so bad those in charge of the media can’t actually handle it? Hi Andy, not having internet since a week – and probably not for another month – I cannot really follow developments anymore, but just saw the remaining three candidats to replace Cameron. Hobson’s choice has just been given a whole new meaning. Same in the US – and much of the rest of Europe. I bet one of the ‘winners’ will be NATO, which already is seen by some as the reason why Europe was united in the first place (!). Sorry to hear that you’re going to be offline – but maybe that is wise. The news is so unremittingly awful everywhere. I cannot believe how the referendum result is now an old story – and Chilcot got just one day in the news. 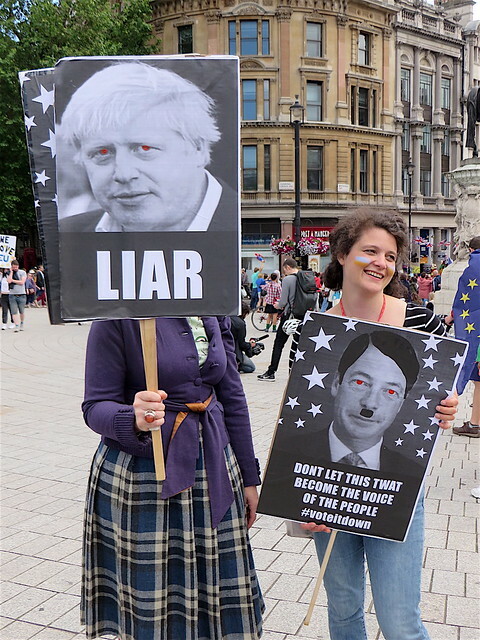 We are still apparently going ahead with our unprovoked suicide, our economy is in freefall, and yet dissent has become a topic apparently worth only a footnote at best, as the Tories – yes, those responsible for all of this – seek to elect a new leader. Hello, media, MPs and people of the UK, we have no leadership, the pound has dropped to $1.16, but we’re not out in the streets. What is wrong with us? The tories just cannot help themselves its a chouise may or angela whatever ..who happens to be anti gay marrage and pro foxhunting ….yet another provincial fuckwit weirdo ..who dosent know jackshit and is extream right wing though the funny thing is ….the torie supporters group staged a protest outside no10 last night in support of angela whoever, lol,lol,lol andy youve never seen such a bunch of dorks,misfits,oddballs,…..virgins…….lol social outcastes……jon snów was laughing at them…..people were laughing at them ….the right wing murdoch media machiean spins ever faster, next,next,next……keep them distracted….leaveing europę will mean a right wing torie dictatorship……though on a welcome good note 130 thousand people have joined the labour party in the last 10 days. I saw only a very little bit of the footage of Flotsam, Jetsam — Leadsom’s supporters, Damo, and remarked to myself that they looked like a particularly inept collection of inadequates. Thanks for the funny account. Mostly, though, like you, I’m sickened that the media is, yet again and as usual, fawning over the Tories, this time via their leadership contest, and conveniently behaving as though everything the other Tories – Cameron, Johnson, Gove, IDS – did up to June 23 has no relevance to anything whatsoever, and doesn’t also damn the rest of the wretched party by association. Its funny remembering how exiteing the 21 century seemed ….like the jetsons a pill for everything,flying cars …..no one would need to work….world peace ,holidays in outaspace …the 21 century is becomeing more like a dark ,bleak war raveged twisted nightmare…..what the hell is going on ….were going mad. That sound like a dream from the 1950s, Damo, whereas, by the ’70s, the decline had begun, which, of course, was then opportunistically seized on by Thatcher and Reagan and the neo-liberals, who decided to fleece everyone to enrich the few. The darkness has followed ever since – the outsourcing and the making redundant of our own people, and the spin and lies to cover that up – as we have become more and more marginalised in our own countries. And in the last 20 years it’s just been greed and war, extinguishing even more of the dwindling light. We need some voices of hope. But real hope, not the kind of fakery that will be endorsed by the corporate world and its stenographers in the media, fashion and PR – the Goebbels of the here and now.